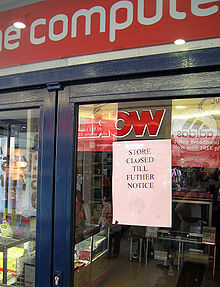 Notice of closure attached to the door of a computer store the day after its parent company declared "bankruptcy" (strictly, put into administration—see text) in the United Kingdom. Bankruptcy or insolvency is a legal status of a person or an organization that cannot repay the debts it owes to its creditors. Creditors may file a bankruptcy petition against a business or corporate debtor ("involuntary bankruptcy") in an effort to recoup a portion of what they are owed or initiate a restructuring. In the majority of cases, however, bankruptcy is initiated by the debtor (a "voluntary bankruptcy" that is filed by the insolvent individual or organisation). An involuntary bankruptcy petition may not be filed against an individual consumer debtor who is not engaged in business. The word bankruptcy is formed from the ancient Latin bancus (a bench or table), and ruptus (broken). A "bank" originally referred to a bench, which the first bankers had in the public places, in markets, fairs, etc. on which they tolled their money, wrote their bills of exchange, etc. Hence, when a banker failed, he broke his bank, to advertise to the public that the person to whom the bank belonged was no longer in a condition to continue his business. As this practice was very frequent in Italy, it is said the term bankrupt is derived from the Italian banca rotta, broken bank (see e.g. Ponte Vecchio). In Ancient Greece, bankruptcy did not exist. If a man owed and he could not pay, he and his wife, children or servants were forced into "debt slavery", until the creditor recouped losses via their physical labour. Many city-states in ancient Greece limited debt slavery to a period of five years and debt slaves had protection of life and limb, which regular slaves did not enjoy. However, servants of the debtor could be retained beyond that deadline by the creditor and were often forced to serve their new lord for a lifetime, usually under significantly harsher conditions. In the Torah, or Old Testament, every seventh year is decreed by Mosaic Law as a Sabbatical year wherein the release of all debts that are owed by members of the community is mandated, but not of "foreigners". The seventh Sabbatical year, or forty-ninth year, is then followed by another Sabbatical year known as the Year of Jubilee wherein the release of all debts is mandated, for fellow community members and foreigners alike, and the release of all debt-slaves is also mandated. The Year of Jubilee is announced in advance on the Day of Atonement, or the tenth day of the seventh Biblical month, in the forty-ninth year by the blowing of trumpets throughout the land of Israel. In Islamic teaching, according to the Qur'an, an insolvent person was deemed to be allowed time to be able to pay out his debt. This is recorded in the Qur'an's second chapter (Sura Al-Baqara), Verse 280, which notes: "And if someone is in hardship, then let there be postponement until a time of ease. But if you give from your right as charity, then it is better for you, if you only knew." Bankruptcy is also documented in East Asia. According to al-Maqrizi, the Yassa of Genghis Khan contained a provision that mandated the death penalty for anyone who became bankrupt three times. Philip II of Spain had to declare four state bankruptcies in 1557, 1560, 1575 and 1596. Spain became the first sovereign nation in history to declare bankruptcy. The principal focus of modern insolvency legislation and business debt restructuring practices no longer rests on the elimination of insolvent entities but on the remodeling of the financial and organisational structure of debtors experiencing financial distress so as to permit the rehabilitation and continuation of their business. For private households, it is argued to be insufficient to merely dismiss debts after a certain period. It is important to assess the underlying problems and to minimise the risk of financial distress to re-occur. It has been stressed that debt advice, a supervised rehabilitation period, financial education and social help to find sources of income and to manage household expenditures better need to be equally provided during this period of rehabilitation (Reifner et al., 2003; Gerhardt, 2009; Frade, 2010). In most EU Member States, debt discharge is conditioned by a partial payment obligation and by a number of requirements concerning the debtor’s behavior. In the United States (US), discharge is conditioned to a lesser extent. Nevertheless, it should be noted that the spectrum is broad in the EU, with the UK coming closest to the US system (Reifner et al., 2003; Gerhardt, 2009; Frade, 2010). Other Member States do not provide the option of a debt discharge. Spain, for example, passed a bankruptcy law (ley concursal) in 2003 which provides for debt settlement plans that can result in a reduction of the debt (maximally half of the amount) or an extension of the payment period of maximally five years (Gerhardt, 2009); nevertheless, it does not foresee debt discharge. Bankruptcy fraud is a white-collar crime. While difficult to generalise across jurisdictions, common criminal acts under bankruptcy statutes typically involve concealment of assets, concealment or destruction of documents, conflicts of interest, fraudulent claims, false statements or declarations, and fee fixing or redistribution arrangements. Falsifications on bankruptcy forms often constitute perjury. Multiple filings are not in and of themselves criminal, but they may violate provisions of bankruptcy law. In the U.S., bankruptcy fraud statutes are particularly focused on the mental state of particular actions. Bankruptcy fraud is a federal crime in the United States. Bankruptcy fraud should be distinguished from strategic bankruptcy, which is not a criminal act, but may work against the filer. All assets must be disclosed in bankruptcy schedules whether or not the debtor believes the asset has a net value. This is because once a bankruptcy petition is filed, it is for the creditors, not the debtor to decide whether a particular asset has value. The future ramifications of omitting assets from schedules can be quite serious for the offending debtor. A closed bankruptcy may be reopened by motion of a creditor or the U.S. trustee if a debtor attempts to later assert ownership of such an "unscheduled asset" after being discharged of all debt in the bankruptcy. The trustee may then seize the asset and liquidate it for the benefit of the (formerly discharged) creditors. Whether or not a concealment of such an asset should also be considered for prosecution as fraud and/or perjury would then be at the discretion of the judge and/or U.S. Trustee. The Bankruptcy Act 1966 (Commonwealth) is the legislation that governs bankruptcy in Australia. Only individuals can become bankrupt; insolvent companies go into liquidation or administration (see administration (insolvency)). There are three "parts" of the act under which the vast majority of "acts of bankruptcy" fall. Part IV (Full Bankruptcy), Part IX Debt Agreements and Part X Personal Insolvency Agreements. Agreements refer specifically to arrangements between creditors and debtors, whereas Part IV relates to full bankruptcy and is generally synonymous with "bankruptcy". A person or debtor can declare himself or herself bankrupt by lodging a debtor's petition with the Official Receiver, which is the Insolvency and Trustee Service Australia (ITSA). A person can also be made bankrupt after a creditor's petition results in the making of a sequestration order in the Federal Magistrates Court. To declare bankruptcy or for a creditors petition to be lodged, a minimum debt of $5,000 is required. All bankrupts are required to lodge a Statement of Affairs document with ITSA, which includes important information about their assets and liabilities. A bankruptcy cannot be annulled until this document has been lodged. Ordinarily, a Part IV bankruptcy lasts three years from the filing of the Statement of Affairs with ITSA. In the case of a debtor's petition, the Statement of Affairs is filed with the petition and the three year period commences immediately. However, in the case of a creditor's petition, the Statement of Affairs will rarely be filed on the same day the court order is made. If the bankrupt fails to lodge the document within a certain period of time, he or she can be prosecuted and fined. A Bankruptcy Trustee (in most cases this is the Official Receiver) is appointed to deal with all matters regarding the administration of the bankrupt estate. The Trustee's job includes notifying creditors of the estate and dealing with creditor inquiries; ensuring that the bankrupt complies with his or her obligations under the Bankruptcy Act; investigating the bankrupt's financial affairs; realising funds to which the estate is entitled under the Bankruptcy Act and distributing dividends to creditors if sufficient funds become available. For the duration of their bankruptcy, all bankrupts have certain restrictions placed upon them under the Act. For example, a bankrupt must obtain the permission of his or her trustee to travel overseas. Failure to do so may result in the bankrupt being stopped at the airport by the Australian Federal Police. Additionally, a bankrupt is required to provide his or her Trustee with details of income and assets. If the bankrupt does not comply with the Trustee's request to provide details of income, the Trustee may have grounds to lodge an Objection to Discharge, which has the effect of extending the bankruptcy for a further five years. The realisation of funds usually comes from two main sources: the bankrupt's assets and the bankrupt's wages. There are certain assets that are protected, referred to as "protected assets". These include household furniture and appliances, tools of the trade and vehicles up to a certain value. All other assets of value will be sold. If a house or car is above a certain value, the bankrupt can buy the interest back from the estate in order to keep the asset. If the bankrupt does not do this, the interest vests in the estate and the trustee is able to take possession of the asset and sell it. The bankrupt will have to pay income contributions if his or her income is above a certain threshold. The threshold is indexed biannually in March and September, and varies according to the number of dependents the bankrupt has. The income contributions liability is calculated by halving the amount of income that exceeds the threshold. If the bankrupt fails to pay the contributions due, the Trustee can issue a notice to garnishee the bankrupt's wages. If that is not possible, the Trustee may lodge an Objection to Discharge, effectively extending the bankruptcy for a further five years. Bankruptcies can be annulled prior to the expiration of the normal three year period if all debts are paid out in full. Sometimes a bankrupt may be able to raise enough funds to make an Offer of Composition to creditors, which would have the effect of paying the creditors some of the money they are owed. If the creditors accept the offer, the bankruptcy can be annulled after the funds are received. After the bankruptcy is annulled or the bankrupt has been automatically discharged, the bankrupt's credit report status will be shown as "discharged bankrupt" for some years. The number of years varies depending on the company issuing the report, but the report will eventually cease to record that information. Certain limited information on Bankruptcy Law in Australia can be found at the ITSA web site. In Brazil, the Bankruptcy Law (11.101/05) disciplines judicial or extrajudicial recuperation & Bankruptcy and is only applicable to private companies, except for financial institutions, credit cooperatives, consortia, entity of supplementary schemes, societies operating health care plan, society of capitalisation and other entities legally treated as issues. This is not applicable to public companies. Current law covers three legal proceedings. The first one is bankruptcy itself ("Falência"). Bankruptcy is the judicial liquidation procedure for an insolvent merchant that promotes the removal of the debtor from its activities, aiming to preserve and optimise productive use of assets, assets and productive resources, including intangible assets, of the company. The final goal of bankruptcy is to liquidate company assets and debtors payment. The second one concerns Judicial Recuperation ("Recuperação Judicial"). Its goal is to allow the overcoming of the economic-financial crisis situation of the debtor, in order to allow the continuation of the source producer, the employment of workers and the interests of creditors, promoting, thus, the preservation of the company, its social function and stimulate the economic activity. It's a judiciary procedure required by the debtor who exercice its activities more than 2 years and have to be approval by the judge. The Extrajudicial Recuperation ("Recuperação Extrajudicial") is a private negotiation that involves creditors and debtors and, as the judicial recuperation, also have to be approved by Judiciary power. Bankruptcy in Canada is set out by federal law, in the Bankruptcy and Insolvency Act and is applicable to businesses and individuals. The office of the Superintendent of Bankruptcy, a federal agency, is responsible for ensuring that bankruptcies are administered in a fair and orderly manner. Trustees in bankruptcy administer bankruptcy estates. Bankruptcy is filed when a person or a company becomes insolvent and cannot pay their debts as they become due. To give such directions to the trustee as the creditors may see fit with reference to the administration of the estate. In Canada, a person can file a consumer proposal as an alternative to bankruptcy. A consumer proposal is a negotiated settlement between a debtor and their creditors. A typical proposal would involve a debtor making monthly payments for a maximum of five years, with the funds distributed to their creditors. Even though most proposals call for payments of less than the full amount of the debt owing, in most cases, the creditors will accept the deal, because if they do not, the next alternative may be personal bankruptcy, where the creditors will get even less money. The creditors have 45 days to accept or reject the consumer proposal. Once the proposal is accepted the debtor makes the payments to the Proposal Administrator each month (or as otherwise stipulated in their proposal), and the creditors are prevented from taking any further legal or collection action. If the proposal is rejected, the debtor is returned to his prior insolvent state and may have no alternative but to declare personal bankruptcy. A consumer proposal can only be made by a debtor with debts to a maximum of $250,000 (not including the mortgage on their principal residence). If debts are greater than $250,000, the proposal must be filed under Division 1 of Part III of the Bankruptcy and Insolvency Act. The assistance of a Proposal Administrator is required. A Proposal Administrator is generally a licensed trustee in bankruptcy, although the Superintendent of Bankruptcy may appoint other people to serve as administrators. In 2006, there were 98,450 personal insolvency filings in Canada: 79,218 bankruptcies and 19,232 consumer proposals. India does not have a clear law on corporate bankruptcy even though individual bankruptcy laws have been in existence since 1874. The current law in force was enacted in 1920 called Provincial Insolvency Act. Legal meaning of the terms bankruptcy, insolvency, liquidation and dissolution are contested in the Indian legal system. There is no regulation or statute legislated upon bankruptcy which denotes a condition of inability to meet a demand of a creditor as is common in many other jurisdictions. Winding up of companies is in the jurisdiction of the Courts which can take a decade even after the Company has actually been declared insolvent. On the other hand, supervisory restructuring at the behest of The Board of Industrial and Financial Reconstruction is generally undertaken using receivership by a Public Finance Institution. The Dutch bankruptcy law is governed by the Dutch Bankruptcy Code ("Faillissementswet"). The code covers three separate legal proceedings. The first is the bankruptcy ("Faillissement"). The goal of the bankruptcy is the liquidation of the assets of the company. The bankruptcy applies to individuals and companies. The second legal proceeding in the Faillissementswet is the "Surseance". The Surseance only applies to companies. Its goal is to reach an agreement with the creditors of the company. The third proceeding is the "Schuldsanering". This proceeding is designed for individuals only. Under Swiss law, bankruptcy can be a consequence of insolvency. It is a court-ordered form of debt enforcement proceedings that applies, in general, to registered commercial entities only. In a bankruptcy, all assets of the debtor are liquidated under the administration of the creditors, although the law provides for debt restructuring options similar to those under Chapter 11 of the U.S. Bankruptcy code. In Sweden, bankruptcy (Swedish: konkurs) is a process that may involve a company or individual. A creditor or the company itself can apply for bankruptcy. An external bankruptcy manager will take over the company or the assests of the person, trying to sell as much as possible. A person or a company in bankruptcy can not access its assets (with some exceptions). It is common for companies in Sweden to reduce their debts through bankruptcy. The owner, or a new owner, starts a new company that buys the important assets including the name from the old company, which is left behind with its debts. The formal bankruptcy process is rarely carried out for individuals. Creditors can claim money through the Enforcement Administration anyway, and creditors do not usually benefit from the bankruptcy of individuals because there are costs of a bankruptcy manager which has priority. Unpaid debts remain after bankruptcy for individuals. People who are deeply in debt can obtain a debt arrangement procedure (Swedish:skuldsanering). On application, they obtain a payment plan under which they pay as much as they can for five years, and then all remaining debts are canceled. The debts must not have come from crime victim compensation and the deptor must not be forbidden to run a company (usually happens because of tax fraud). This process was introduced in 2006. Before that, all unpaid debts remained during the life of a person. The most common reasons for personal insolvency in Sweden are illness, unemployment, divorce or company bankruptcy, not reckless spending. In the United Kingdom, bankruptcy (in a strict legal sense) relates only to individuals (including sole proprietors) and partnerships. Companies and other corporations enter into differently-named legal insolvency procedures: liquidation and administration (administration order and administrative receivership). However, the term 'bankruptcy' is often used when referring to companies in the media and in general conversation. Bankruptcy in Scotland is referred to as sequestration. To apply for your own bankruptcy in Scotland you must have more than £1500 of debt. After the increase in 2005 and 2006 the figures have remained stable. The UK bankruptcy law was changed in May 2000, effective May 29, 2000. Debtors may now retain occupational pensions while in bankruptcy, except in rare cases. Bankruptcy in the United States is a matter placed under Federal jurisdiction by the United States Constitution (in Article 1, Section 8, Clause 4), which allows Congress to enact "uniform laws on the subject of bankruptcies throughout the United States." The Congress has enacted statute law governing bankruptcy, primarily in the form of the Bankruptcy Code, located at Title 11 of the United States Code. Federal law is amplified by state law in some places where Federal law fails to speak or expressly defers to state law. While bankruptcy cases are always filed in United States Bankruptcy Court (an adjunct to the U.S. District Courts), bankruptcy cases, particularly with respect to the validity of claims and exemptions, are often dependent upon State law. State law therefore plays a major role in many bankruptcy cases, and it is often not possible to generalise bankruptcy law across state lines. Generally, a debtor declares bankruptcy to obtain relief from debt, and this is accomplished either through a discharge of the debt or through a restructuring of the debt. Generally, when a debtor files a voluntary petition, his or her bankruptcy case commences. Chapter 15: ancillary and other international cases; provides a mechanism for dealing with bankruptcy debtors and helps foreign debtors to clear debts. The most common types of personal bankruptcy for individuals are Chapter 7 and Chapter 13. As much as 65% of all U.S. consumer bankruptcy filings are Chapter 7 cases. Corporations and other business forms file under Chapters 7 or 11. In Chapter 7, a debtor surrenders his or her non-exempt property to a bankruptcy trustee who then liquidates the property and distributes the proceeds to the debtor's unsecured creditors. In exchange, the debtor is entitled to a discharge of some debt; however, the debtor will not be granted a discharge if he or she is guilty of certain types of inappropriate behavior (e.g. concealing records relating to financial condition) and certain debts (e.g. spousal and child support, student loans, some taxes) will not be discharged even though the debtor is generally discharged from his or her debt. Many individuals in financial distress own only exempt property (e.g. clothes, household goods, an older car) and will not have to surrender any property to the trustee. The amount of property that a debtor may exempt varies from state to state. Chapter 7 relief is available only once in any eight year period. Generally, the rights of secured creditors to their collateral continues even though their debt is discharged. For example, absent some arrangement by a debtor to surrender a car or "reaffirm" a debt, the creditor with a security interest in the debtor's car may repossess the car even if the debt to the creditor is discharged. The 2005 amendments to the Bankruptcy Code introduced the "means test" for eligibility for chapter 7. An individual who fails the means test will have his or her chapter 7 case dismissed or may have to convert his or her case to a case under chapter 13. Generally, a trustee will sell most of the debtor’s assets to pay off creditors. However, certain assets of the debtor are protected to some extent. For example, Social Security payments, unemployment compensation, and limited values of your equity in a home, car, or truck, household goods and appliances, trade tools, and books are protected. However, these exemptions vary from state to state. In Chapter 13, the debtor retains ownership and possession of all of his or her assets, but must devote some portion of his or her future income to repaying creditors, generally over a period of three to five years. The amount of payment and the period of the repayment plan depend upon a variety of factors, including the value of the debtor's property and the amount of a debtor's income and expenses. Secured creditors may be entitled to greater payment than unsecured creditors. Relief under Chapter 13 is available only to individuals with regular income whose debts do not exceed prescribed limits. If you are an individual or a sole proprietor, you are allowed to file for a Chapter 13 bankruptcy to repay all or part of your debts. Under this chapter, you can propose a repayment plan in which to pay your creditors over three to five years. If your monthly income is less than the state's median income, your plan will be for three years unless the court finds "just cause" to extend the plan for a longer period. If your monthly income is greater than your state's median income, the plan must generally be for five years. A plan cannot exceed the five-year limitation. In contrast to Chapter 7, the debtor in Chapter 13 may keep all of his or her property, whether or not exempt. If the plan appears feasible and if the debtor complies with all the other requirements, the bankruptcy court will typically confirm the plan and the debtor and creditors will be bound by its terms. Creditors have no say in the formulation of the plan other than to object to the plan, if appropriate, on the grounds that it does not comply with one of the Code's statutory requirements. Generally, the payments are made to a trustee who in turn disburses the funds in accordance with the terms of the confirmed plan. When the debtor completes payments pursuant to the terms of the plan, the court will formally grant the debtor a discharge of the debts provided for in the plan. However, if the debtor fails to make the agreed upon payments or fails to seek or gain court approval of a modified plan, a bankruptcy court will often dismiss the case on the motion of the trustee. Pursuant to the dismissal, creditors will typically resume pursuit of state law remedies to the extent a debt remains unpaid. In Chapter 11, the debtor retains ownership and control of its assets and is re-termed a debtor in possession ("DIP"). The debtor in possession runs the day to day operations of the business while creditors and the debtor work with the Bankruptcy Court in order to negotiate and complete a plan. Upon meeting certain requirements (e.g. fairness among creditors, priority of certain creditors) creditors are permitted to vote on the proposed plan. If a plan is confirmed the debtor will continue to operate and pay its debts under the terms of the confirmed plan. If a specified majority of creditors do not vote to confirm a plan, additional requirements may be imposed by the court in order to confirm the plan. Chapter 7 and Chapter 13 are the efficient bankruptcy chapters often used by most individuals. The chapters which almost always apply to consumer debtors are chapter 7, known as a "straight bankruptcy", and chapter 13, which involves an affordable plan of repayment. An important feature applicable to all types of bankruptcy filings is the automatic stay. The automatic stay means that the mere request for bankruptcy protection automatically stops and brings to a grinding halt most lawsuits, repossessions, foreclosures, evictions, garnishments, attachments, utility shut-offs, and debt collection activity. Under the new law, Americans who have the ability to pay will be required to pay back at least a portion of their debts. Those who fall behind their state's median income will not be required to pay back their debts. The new law will also make it more difficult for serial filers to abuse the most generous bankruptcy protections. Debtors seeking to erase all debts will now have to wait eight years from their last bankruptcy before they can file again. The law will also allow us to clamp down on bankruptcy mills that make their money by advising abusers on how to game the system. Among its many changes to consumer bankruptcy law, BAPCPA enacted a "means test", which was intended to make it more difficult for a significant number of financially distressed individual debtors whose debts are primarily consumer debts to qualify for relief under Chapter 7 of the Bankruptcy Code. The "means test" is employed in cases where an individual with primarily consumer debts has more than the average annual income for a household of equivalent size, computed over a 180 day period prior to filing. If the individual must "take" the "means test", their average monthly income over this 180 day period is reduced by a series of allowances for living expenses and secured debt payments in a very complex calculation that may or may not accurately reflect that individual's actual monthly budget. If the results of the means test show no disposable income(or in some cases a very small amount) then the individual qualifies for Chapter 7 relief. If a debtor does not qualify for relief under Chapter 7 of the Bankruptcy Code, either because of the Means Test or because Chapter 7 does not provide a permanent solution to delinquent payments for secured debts, such as mortgages or vehicle loans, the debtor may still seek relief under Chapter 13 of the Code. A Chapter 13 plan often does not require repayment to general unsecured debts, such as credit cards or medical bills. BAPCPA also requires individuals seeking bankruptcy relief to undertake credit counseling with approved counseling agencies prior to filing a bankruptcy petition and to undertake education in personal financial management from approved agencies prior to being granted a discharge of debts under either Chapter 7 or Chapter 13. Some studies of the operation of the credit counseling requirement suggest that it provides little benefit to debtors who receive the counseling because the only realistic option for many is to seek relief under the Bankruptcy Code. This section needs additional citations for verification. During 2004, the number of insolvencies reached all time highs in many European countries. In France, company insolvencies rose by more than 4%, in Austria by more than 10%, and in Greece by more than 20%. The increase in the number of insolvencies, however, does not indicate the total financial impact of insolvencies in each country because there is no indication of the size of each case. An increase in the number of bankruptcy cases does not necessarily entail an increase in bad debt write-off rates for the economy as a whole. In Austria, more than half of all potential bankruptcy proceedings in 2004 were not opened, due to insufficient funding. In Spain, it is not economically profitable to open insolvency/bankruptcy proceedings against certain types of businesses, and therefore the number of insolvencies is quite low. For comparison: In France, more than 40,000 insolvency proceedings were opened in 2004, but under 600 were opened in Spain. At the same time the average bad debt write-off rate in France was 1.3% compared to Spain with 2.6%. The insolvency numbers for private individuals also do not show the whole picture. Only a fraction of heavily indebted households will decide to file for insolvency. Two of the main reasons for this are the stigma of declaring themselves insolvent and the potential business disadvantage. ^ See 140 Cong. Rec. S14, 461 (daily ed. Oct. 6, 1994). ^ See 18 U.S.C. sec 152. http://trac.syr.edu/laws/18USC152.html. ^ http://www.planalto.gov.br/ccivil_03/_Ato2004-2006/2005/Lei/L11101.htm BRAZIL. Law 11,105/05. ^ "Insolvency in Canada in 2006": Office of the Superintendent of Bankruptcy (Industry Canada). Retrieved 2007-05-30. ^ "Hearing before the Senate Judiciary Committee on Bankruptcy Reform", 109th Cong. February 10, 2005. Retrieved July 30, 2007. ^ Press Release, White House, "President Signs Bankruptcy Abuse Prevention, Consumer Protection Act" (April 20, 2005). Retrieved July 30, 2007. Balleisen, Edward (2001). Navigating Failure: Bankruptcy and Commercial Society in Antebellum America. Chapel Hill: University of North Carolina Press. pp. 322. ISBN 0-8078-2600-6. DePamphilis, Donald M. (2009). Mergers, Acquisitions, and Other Restructurings, 5th Edition. Elsevier, Academic Press. ISBN 978-0-12-374878-2. Sandage, Scott A. (2006). Born Losers: A History of Failure in America. Cambridge, Mass. : Harvard University Press. ISBN 0-674-02107-X. Wikisource has the text of the 1911 Encyclopædia Britannica article Bankruptcy. This page was last modified on 25 April 2011 at 05:48.